The BAADER Fringe-Killer Filter minimizes unwanted blue fringing, comparable to a Minus-Violet-Filter, while retaining a very pleasing color balance. This would be a contradiction in itself – only made possible by applying modern DWDM plasma assisted coating technology, allowing almost a hundred coating layers to be accumulated onto a planoptically polished substrate – without destroying the optical figure! This fineoptical tool will help a small refractor to really put the advertized magnification within reach. Performance rivals that of the most expensive color correcting lens systems, costing 20 times as much! `Breaks` the intensity of the devastating false blue color in a completely new way, never ever before manufactured as astronomical filter. 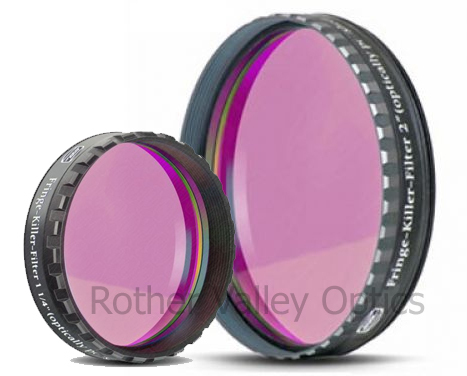 Retains the highest light transmission of all known color correcting devices – be it filters or lenses – in all important deep sky wavelengths from 486/501 up to 656 nm. LIGHT is `the hottest commodity` for high magnification work. Subtlest of color variations remain visible in planetary surface detail, due to the excellent color balance. Combine with our 31.7mm Red RG-610 color filter, to receive an ultra narrow (70nm) wide H-alpha passband filter of unheared of 95% peak transmission at world‘s lowest price!.